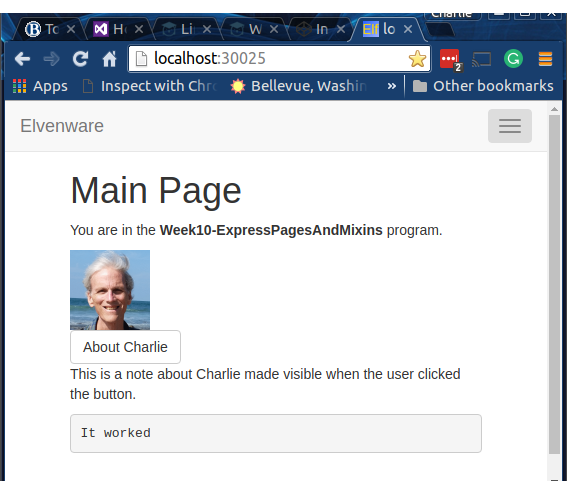 In the Express Pages and Mixins assignment you will learn about Jade, bootstrap and mixins. I'd like you to build a single page app (SPA) that switches between showing the main page and the about page. When the user clicks the Help button, the user is shown the text that begins "Select some controls...". 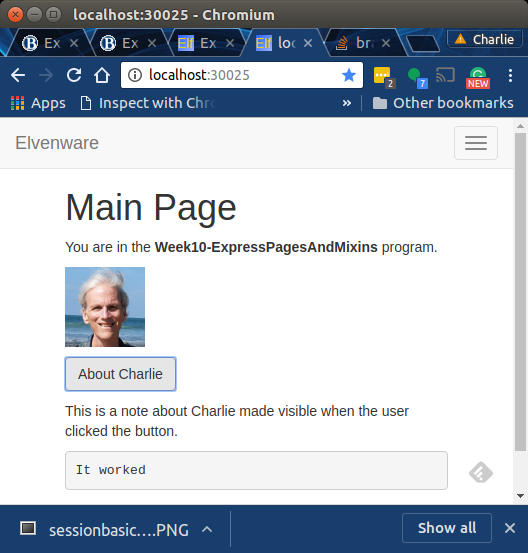 When the user clicks the About Charlie button, the user is shown the text that begins with the words "This is a note...". After we covered this method in class, I realized that it could throw an exception in a unit tests because it may not be able to find the menus, which at least for now, may not be part of your tests. So I have added a try catch statement to suppress the exception if it occurs. I should add that in some cases, you may not need this code. It's purpose is to help you clear and set the highlight over a menu item when the mouse hovers over it. In some cases, Bootstrap will do that for you automatically. But if it is not doing that properly, try inserting this code. Note that the selector nav li may not properly select the mouse hover events in some cases, depending on how you crafted your HTML. If necessary, compose another selector. You have to pass in the name of the theme you want to use, as described above. NOTE: You can use either jade or pug. When the user clicks on the home button, the code in control.js should be in effect. When the user clicks on the about button, the code in about.js should be in effect. Put a button on each page. When the user clicks on a button, place text on the appropriate page in an HTML paragraph element. For instance, if the user clicks on the About button, then text should appear on the About page. Put the button handler for the help button in Control.js. An explanation is in the [node discussion on Elvenware][node-js-parmas]. Make sure the folder is named correctly. Push your work and submit your assignment.